But the steady returns for the NPI mask some dynamic changes taking place between the various property sectors that make up the NPI. Industrial properties which are primarily warehouse continue to be the stellar performer with a quarterly return of 3.25% for the quarter. A distant second was office at 1.80% followed by apartment at 1.5%. Retail was only 0.72% for the quarter and had a negative capital return (change in value net of capital expenditures). The spread between industrial and retail returns is a “tale of two sectors” with online shopping creating increased demand for last mile warehouse space and hurting many traditional retailers. 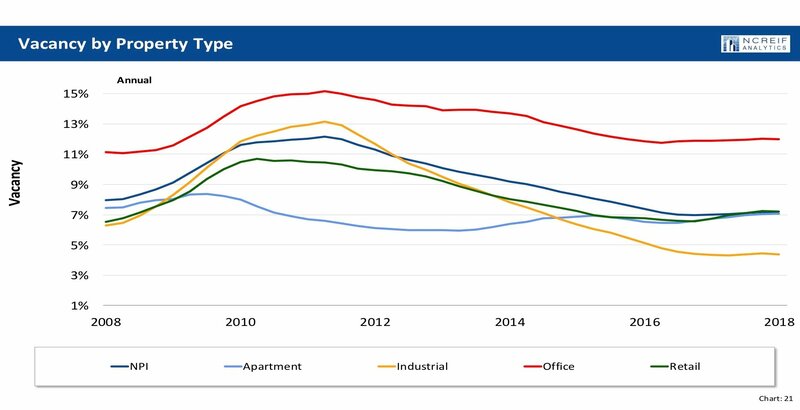 What is striking is how the spread between returns for industrial and retail space have widened since 2010. That spread was negative 1.25% in 2010 and is now a positive 2% (rounded). The spread increased rather significantly from about zero in 2015 to the current spread of 2%. Of the larger markets, LA had the highest return this past quarter followed by San Francisco. These CBSAs had returns that were higher than the NPI. DC and New York at the lowest returns. So, there is a coastal affect in the current quarter returns. Although returns have been dropping, price appreciation remains positive and price levels have continued to reach new highs. Vacancy rates vary somewhat among property types. 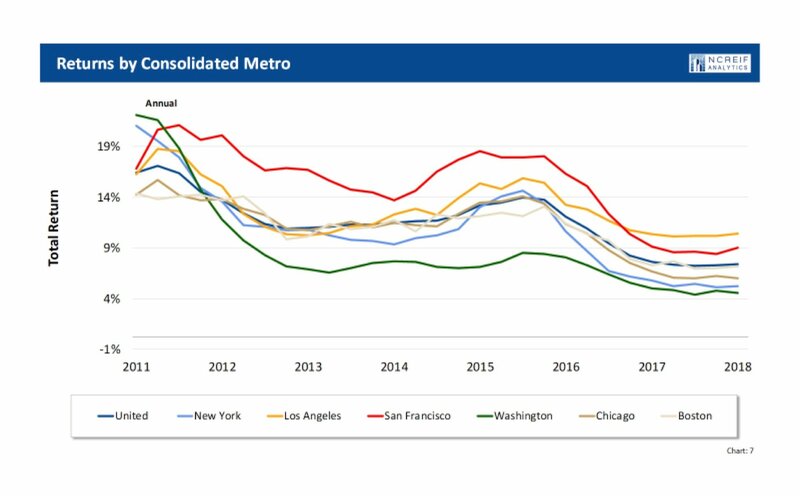 Industrial properties have the lowest vacancy rate which us under 5% nationally whereas office has the highest vacancy rate of about 12%. The industrial sector was the only one with significantly positive NOI growth. The other sectors were close to zero. If NOI growth continues to be negative, this could ultimately put pressure on returns – especially if cap rates increase. Cap rates declined slightly for the quarter from about 5% to 4.86% but there could be upward pressure as interest rates start to rise. Cap rates remain at historic lows despite concerns that interest rates will rise. Higher interest rates could put upward pressure on cap rates although this could be offset by higher inflationary expectations. As noted above, returns have been very stable for over a year. 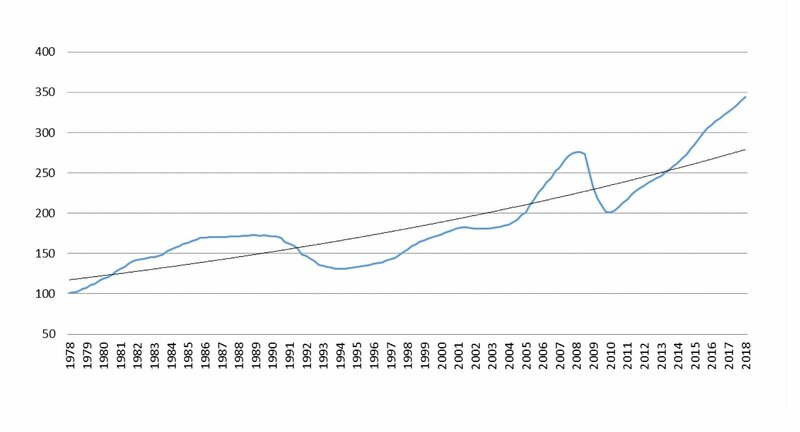 But this mask the dynamics going on within property sectors with industrial warehouse returns increasing and retail returns decreasing. The winner of this tug of war may ultimately determine if the NPI property values continue to rise. To hear more from Dr. Fisher, please join our Q2 2018 CRE Market update by registering here.